This week, Alison Garden (Northumbria University) considers the representation of the British military in the recent film ’71 and what it can reveal about the relationships between the nations. While Alison has tried to avoid spoilers, some are implicit in the post below. This blog post also contains language that some readers may find offensive. Like some previous writers for this blog, [i] I believe that thinking about Northern Ireland from a four nations perspective is particularly fruitful. 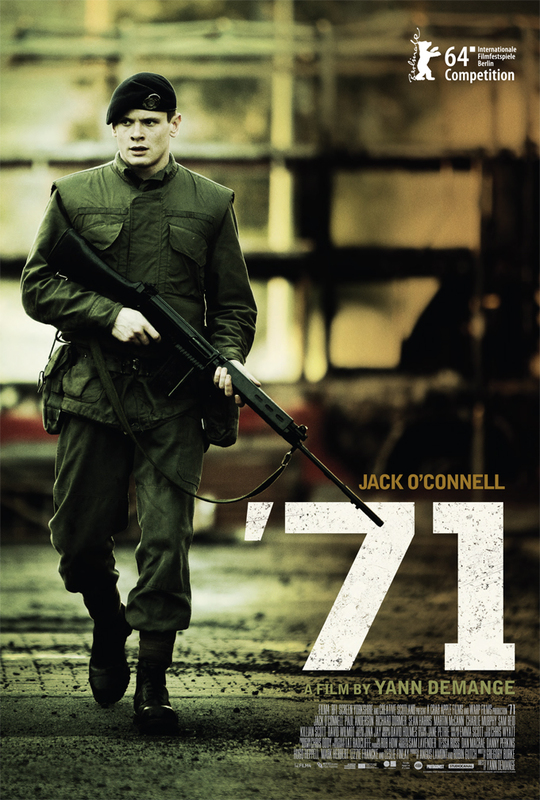 In this post, I explore the representation of the British military in the North as depicted in Yann Demange’s film ’71 (2014).’71 provides us with a wealth of material probing at the distinctions between the peoples that populate the four nations of the British Isles and is actually, despite its efforts to the contrary, revealing of certain recalcitrant cultural ideas about differences between the ‘Celtic’ Irish and ‘Anglo Saxon’ British. Demange’s film focuses on a teenage solider, Gary Hook (Jack O’Connell), on deployment in Belfast in 1971; sent to offer support to a RUC search on the Falls Road that turns violent, Hook is unintentionally left behind by his unit and so begins a deadly game of cat and mouse as he attempts to survive the night. The script, by Gregory Burke of Black Watch fame, begins by positioning Northern Ireland very much within the UK; at multiple times throughout the beginning section, military personnel who repeatedly tell the soldiers that ‘you are not leaving the country’ labour this point. But the film makes much of the crossing over the Irish Sea on both the outward and return journeys. Compared to the pastoral landscapes of rural Derbyshire, where Hook is from, the dilapidated streets and burnt-out cars of urban Belfast are quite clearly meant to signify that what greets the soldiers is ‘another world’. What the film does well is illustrate quite how diverse the British Army is, with a smattering of accents from across Scotland, Wales (albeit very briefly) and Northern England. Even Britain’s former colonies are represented, with the presence of a black Caribbean corporal (Babou Ceesay) who likes to call the locals ‘Paddies’: exemplifying the strained allegiances that characterise the region and the complicated legacies of racism in the post-imperial Anglophone world. As anyone who has spent time in the British Isles will know, there’s not just geography in your accent, there’s class and education. Demange does a reasonable job of subverting what we might expect with this in some cases, while completely reaffirming regional and national stereotypes in others. For example, the young, newly appointed Lieutenant Armitage (Sam Reid) has an accent that speaks of his wealth and private education; in a less subtle film about the Troubles (I’m looking at you, Some Mother’s Son), these cut-glass English accents are, of course, clear markers of colonial antagonists. But Armitage shows real concern not only for Hook after he is left behind, but also for the Republican community in Belfast – he believes he is there to protect them. Armitage proves somewhat inept as a military tactician and is contrasted against a battle-hardened Scottish soldier (performing another cliché) who knows his stuff. So when one character later utters the overblown and now infamous line that the army is simply ‘posh cunts telling thick cunts to kill poor cunts’, this doesn’t actually tally with the film’s earlier action. The fact that this line is uttered by a Republican man (Richard Dormer), living in the Divis Flats, who has retired from twenty years service as a medic in the British Army is, however, another instance of Demange’s carefully calculated entangled allegiances. After Hook is left behind by his unit, the film descends into a Dantesque labyrinthine nightmare that becomes increasingly hellish, the foggy darkness of the streets illuminated only by the orange afterglow of petrol bombs and burning cars. But, as the film develops and complex webs of loyalties and betrayals are established, it becomes apparent that the contrite ‘us versus them’ dichotomy so strenuously played up by Burke’s script at the film’s start begins to disintegrate. Hook comes into contact with members of the MRF (Military Reaction Force), the British Army’s intelligence gathering and counter-insurgency team; he also finds himself caught in the fallout between the original IRA (Irish Republican Army) and the PIRA (Provisional IRA) as the latter become increasingly militant. Ultimately, the film works to suggest that these men of violence – Irish and British – although subject to more convoluted, tangled loyalties than viewers might expect, are basically the same as each other: dangerous and disingenuous. ’71 might avoid the blatant partiality of Some Mother’s Son but the politics of red hair are still at play: Boyle (David Wilmcot), our original IRA man, has sandy red hair, as does a little girl that Hook encounters in the Divis Flats, the Republican stronghold. Curiously enough, Sean Harris, who plays MRF man Captain Browning, naturally has red hair but dyed it brown to play the English character. This is strangely reductive: if there are differences between the Irish and the British, they cannot be simplified to such facile signposts. Even the names of the ‘English’ actors – Jack O’Connell, Sean Harris – are testament to the degree of confluence that characterises the British Isles. For, as a four nations methodology explicates, the relationships between these nations, while clearly far from equal, are knotty and inescapable. [i] Jacob Murphy highlights that taking a four nations approach to the ‘Troubles’ could prove illuminating and Caroline Magennis laments the dearth of comparative criticism on contemporary Northern Irish fiction. [iii] Amanda Third, “Does the Rug Match the Carpet?”: Race, Gender, and the Redheaded Woman”, Amanda Third, from The Irish in Us: Irishness, Performativity, and Popular Culture, ed. Diane Negra (London: Duke University Press, 2006), 221. In 2015 Alison Garden will be Visiting Early Career Scholar in American Studies at Northumbria University before taking up a Postdoctoral Fellowship at University College Dublin funded by the Leverhulme Trust. Her research interests include literature of the Irish and black Atlantics, the intersection of postcolonial and ‘world’ literatures, and Northern Irish literature and culture. You can follow her on Twitter at @notsecretgarden and find her research at: https://edinburgh.academia.edu/AlisonGarden. This entry was posted in British army, Film, Five nations?, Identity, Methodology, Northern Ireland, The Troubles, Troubles, Urban history and tagged Film, Four Nations History, Jack O'Connell, Media, Northern Ireland, Troubles. Bookmark the permalink. Hi Neil, thanks very much for your comment. This film sounds fascinating. For all the work by military and political historians on the British military in Northern Ireland, there’s been relatively little about representations in film and literature of their presence. I’ll have to try and track down both the film and the book. I wonder if the Welsh soldier sympathises with the Irish because of his own ‘Celtic’ background…? Sounds really interesting anyway (and also that it wasn’t shown on Channel 4), so thanks very much for the suggestions! You’re welcome. Something went wrong with the shift key the numbers at the end should be the date of publication of the late Dave Berry’s book (1994). I write something about the film in the course of a broader article some years ago; ‘Nice People and Rednecks: Irish Studies in Britain’ Planet: The Welsh Internationalist, No.80 April – May, 1990, pp. 87-93.